No matter how many times we see this script play out, it never gets old. Down by 10 points in the fourth quarter of the AFC Championship Game against the best defense in the NFL, Tom Brady had a daunting task. And his two best receivers Julian Edelman and Rob Gronkowski weren’t available. So, Brady did what he always seems to do, he saved his best for last. He was absolutely spot on in the fourth quarter and his favorite target was Danny Amendola. The diminutive but tough as nails slot receiver always seems to make a big catch at crunch time of big games and he scored both Patriots touchdowns in the fourth quarter but perhaps his biggest catch was on 3rd and 18. Brady, sore hand and all with a dozen stitches in the thumb web of his throwing hand, lasered a dime to Amendola down the middle for a huge first down that saved the Patriots season. Later, with the game on the line with under three minutes to go, Brady tried to find a receiver underneath just over the goal line. It was covered and he launched a pass to the back of the end zone to Amendola. And the little guy with the best hands on the team made a great catch and got both feet inbounds before tumbling out of the end zone. Touchdown, Patriots take the lead, thank you very much, drive safely heading out on Route 1. Brady was 26-38 for 290 yards with two touchdowns. 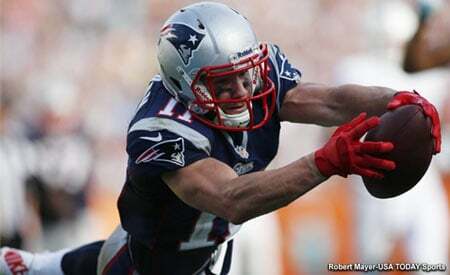 Amendola had seven catches for 84 yards and two touchdowns. Brandin Cooks had six catches for 100 yards including drawing a couple of big pass interference penalties. Lost in the late game heroics was the outstanding day by Blake Bortles, the Jaguars much-maligned quarterback. Even after putting up 45 points on the Steelers last week in Pittsburgh, Bortles still heard the talk. He played a cool, calm and collected game today, hitting the shallow crosses underneath all game long and never made a mistake. Bortles finished 23-36 for 293 yards and a touchdown, a beautifully designed play where he rolled out sucking Eric Lee in. Pat Chung, stuck in no man’s land between Bortles and the receiver was frozen and Bortles lobbed a too easy touchdown to Marcedes Lewis for a 7-3 Jaguars lead. On their next drive, the Jags mixed the run and pass perfectly and sliced and diced the Patriots defense much too easily for a 77-yard drive in 10 plays with Leonard Fournette powering in from four yards out to make it 14-3 and Foxboro was getting ominously quiet. But right before the half, Jacksonville was hit with two major penalties and set the Patriots up for a touchdown right before the half. Barry Church tried to break up a pass to Rob Gronkowski and got flagged for a helmet-to-helmet hit. It was clearly not a dirty hit, Church attempted to lead with his shoulder but was one of those bang-bang plays. Gronkowski left with a concussion and didn’t return. His status for the Super Bowl will bear watching when the Patriots play Philadelphia. The next penalty on A.J. Bouye was also an easy call. Bouye rode Cooks out of bounds while the ball was in the air, but the tinfoil hat conspiracy theorists acted like it was the Brinks heist. Please. James White ran it in and the Patriots were back in the game at 14-10 at the break. The Jaguars were controlling the line of scrimmage on both sides of the ball in the first half and if the Patriots were going to win, they needed to do a better job in the trenches. The Jaguars got two field goals to push the lead to 20-10 but the Patriots defense stiffened down the stretch and they took away the run and began to finally get some pressure on Bortles, forcing him to unload the ball early on a few throws. And one of the key players was James Harrison who pressured Bortles and then knocked the ball out. He and Kyle Van Noy combined for a key sack of Bortles. Then it was Gilmore’s time to shine. But the play of the game defensively, perhaps of the year was the 4th and 14 pass from Bortles to Dede Westbrook was broken up on just an incredible play by Gilmore. The cornerback from South Carolina has been a whipping boy for the fans since inking a big contract in free agency and struggling the first few weeks of the season. But since Gilmore has been simply excellent and he saved what would have a first and goal from about the six-yard line. The Patriots took over on downs and Dion Lewis iced it with a huge first down to send the team to Minneapolis. The defense, while far from great, did a very good job of slowing down the Jaguars’ Fournette who had 76 yards rushing on 24 carries, an average of just 3.2 yards per carry. That took away the Jaguars ability to close the deal when they had the 10 point lead and set the stage for Brady’s heroics once again. So the Patriot haters in the NFL world will all be rooting for the Eagles two weeks from tonight as the two tee off in Super Bowl LII. But the Patriots don’t care. They like it that way. Especially with a 40-year old QB who is always at his best when the biggest games on the biggest stage are at stake. We’re on to Minneapolis…and the Eagles. Not Done Yet. 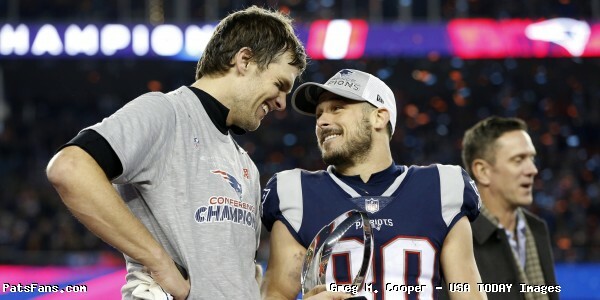 This entry was posted in 2017 Patriots Postseason, NFL Commentary, Patriots Commentary, Patriots News and tagged 2017 Patriots Season, Bill Belichick, Blake Bortles, Chris Hogan, Danny Amendola, Dede Westbrook, Dion Lewis, Jacksonville Jaguars, James Harrison, James White, Leonard Fournette, New England Patriots, NFL, Patriots, Rob Gronkowski, Stephon Gilmore, Tom Brady, Trey Flowers on January 21, 2018 by Steve Balestrieri.